Like all New Yorkers worth their salt, I love Jewish delis. I can't explain it. There's something about getting a sandwich that's 100% meat that's very satisfying. Sure, I love veggies between my bread, too. But that's not what you go to a Jewish deli for. You go for a baseball of meat and two slabs of rye. And an egg creme. 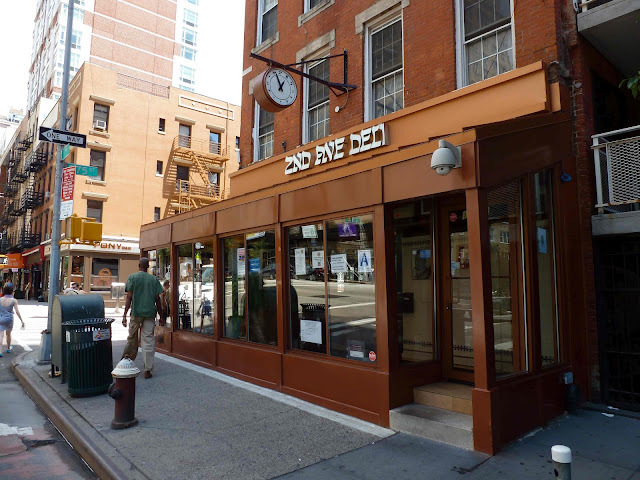 Despite moving from its famous Second Avenue location to both First and Third Avenues, the 2nd Avenue Deli is one of my favorites... and not just because it hasn't been co-opted by tourists and drunks. My last foray into the 2nd Avenue Deli was months ago and I left so full that I couldn't breathe. What can I say? Meat is heavy. Truth be told, I don't think that vegetables exist in places like this. Meat, carbs, cheese... coffee? The closest to green you're likely to find is a pickle. Suffice it to say, unless you have a few books floating around you've been meaning to get to, I'd invest in some Metamucil after a meal like this. This time, I went with Bro and Dudeman and, once again, I weighed far more coming out than going in. First order of business that everyone should know is that the 2nd Avenue Deli, while looking like any upscale diner that would sell sandwiches, soups, and cow-hoof-cartilage, is far from priced like one. Sandwiches start around $15 and go as high as $30. Soup is $8 a bowl and entrees average $25. Therefore, we all ordered the soup/half sandwich combo. Bro and I also ordered a couple of sides. To start with, the sides. I ordered a Cheese Blintz. It's basically a crepe filled with cheese (or cherry or apple) and with a bit of apple sauce to dip it in. It's great. Get it and don't look back. The cheese was far sweeter than I was expecting and with the apple sauce to accompany it, it was like starting with dessert. Bro ordered a Potato Knish. 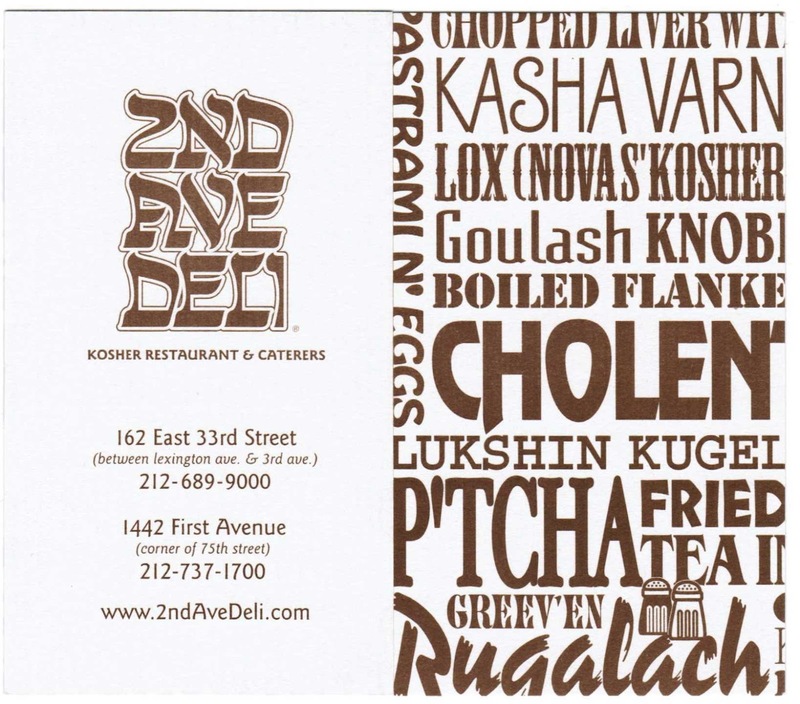 Living a hop, skip, and a jump from Knish Nosh has spoiled me, so I wasn't completely blown away by this otherwise perfectly fine, if a little but dry, Jewish deli standard. Up next came our soups. 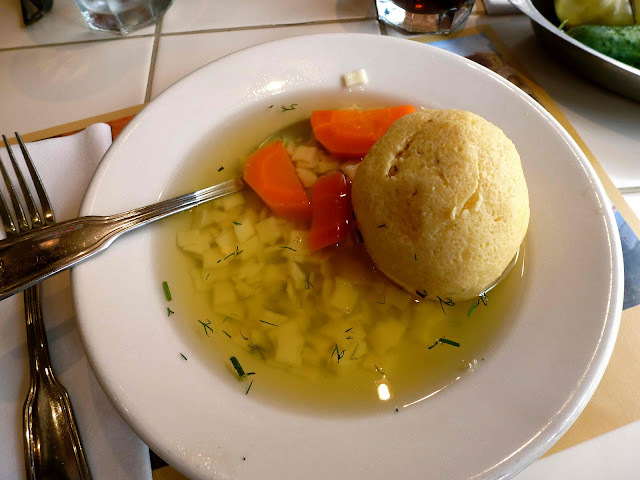 Bro and I both took the Matzo Ball Soup route because, well, when I eat at delis, I order a matzo ball soup. It's just what you do. I'd always assumed that the other soups (save the borscht) was there just to fill up space on the menu, but then Dudeman went and ordered the Mushroom Barley Soup. My soup, the matzo ball soup you see pictured, was good. The ball was a little heavy on the egg and a little dense for my taste. But on the whole, I liked it. I liked my Mom's more, don't get me wrong, but on a scale of 1-10 I give it an 7. An 8 without the noodles. I don't know why people insist on putting noodles in their matzo ball soup. Dudeman's mushroom barley was loved by him and made me feel relatively indifferent. Different strokes, I suppose, but I found it a little too reliant on salt. It wasn't bad, but it didn't stand out. As I said, sandwiches at delis here are meat between rye bread. And that's it. 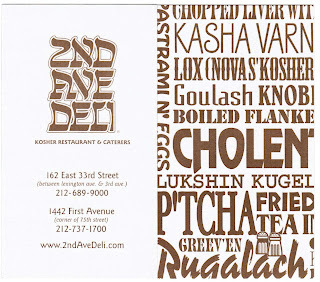 The 2nd Avenue Deli is kosher, so no cheese. And forget that having a salad bar's worth of vegetables tossed in there. This ain't Subway. Normally, I go for a roast beef sandwich. There's something about half cooked, paper thin beef with blood dripping onto the plate and turning your bread into a worthless accoutrement that I find appealing. 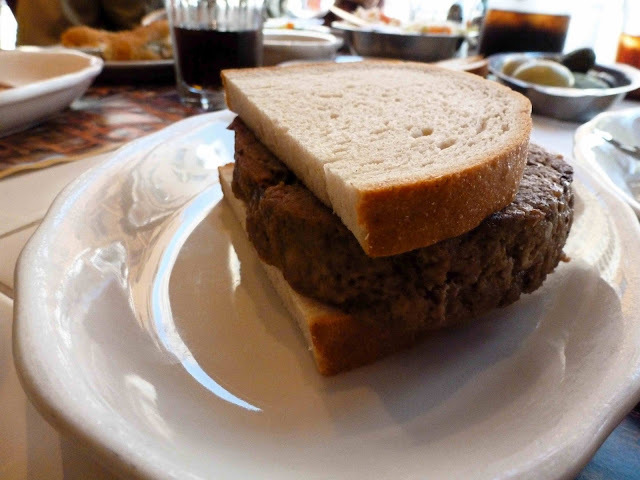 This time I ordered the Meatloaf Sandwich. Bro and Dudeman preferred it over their sandwiches, while I was left feeling blase. I will admit a striking improvement once mustard was applied. They have very good mustard here. 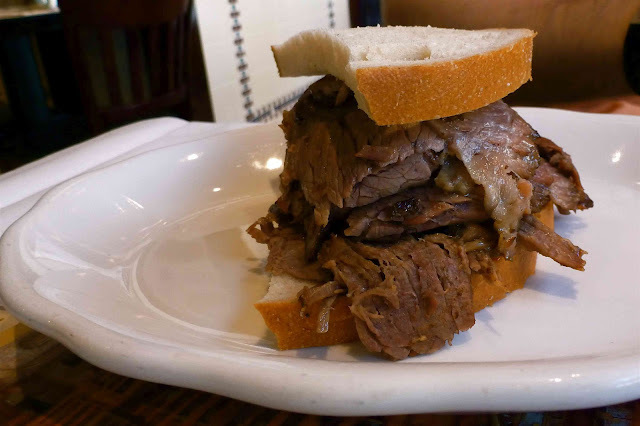 Bro ordered the Brisket Sandwich, which I liked more than he did. It's a bit fatty, but all flavor. Dudeman chose the Pastrami Sandwich, a staple. I loved it. And how can you not? It's six inches of pastrami. 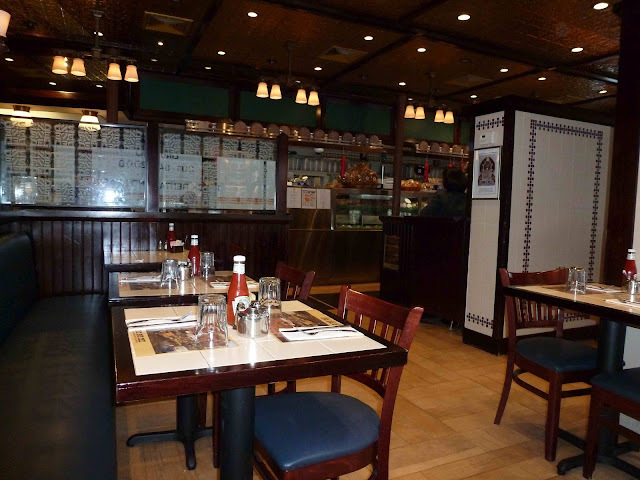 Our meal of three soup/half sandwich combos, a pitcher of cola, a knish, and a blintz, plus tax, plus tip, came to just shy of $78.